Finally found the house of your dreams? Looking to sell your grandpa’s hundred year old property and move to a place in the city? Well, there is a lot that you need to do. With your ever-growing to-do list, it is only normal not to have enough time to cover all bases. One particular task that needs to be carried out, though, is a proper mold inspection. Did you know? Most homeowners miss out on getting a mold inspection performed, and end up spending over thousands in tearing down walls to fight mold infestation in the later years to come? Commonly marked by patches on your walls, mold is a household fungus with the potential to harm your health and that of your homes. Hiding behind your bathroom tile and in-between damp walls, the presence of mold is not easy to determine. Therefore, getting a mold inspection completed before you purchase or sell a house is a significant necessity. Not convinced, yet? Continue reading to learn more about the impact of mold infestations on your life and understand why a mold inspection is not an expense, but an investment. Mold is toxic – you probably already know that. However, most people remain unaware of the presence of mycotoxins often found in molds, such as, Stachybotrys chartarum. Leading to a number of health-related problems such as migraines, shortened attention spans, or loss of memory, the presence of such toxins can take a severe toll on anyone’s health. Keeping this in mind, performing a mold inspection can mean taking an additional measure to protect your family or that of your new buyers. Severe coughing, sneezing, nasal congestion, and sore eyes are all signs of the many ways mold can worsen your allergies and land you in the ER. The Asthma and Allergy Foundation of America New England Chapter, notes “In rare cases, a serious illness called allergic bronchopulmonary aspergillosis develops.” Causing permanent damage to the lungs and promoting additional allergies, such as, atopic dermatitis (eczema), urticaria (hives) and allergic rhinitis (hay fever), investing in a regular mold inspection is an important way to protect individuals with allergies. Moving into a new house or selling your property are all important reasons to get a mold inspection performed. However, the arrival of a new baby in the house, or the presence of an infant, make the need for this service become even more critical. While toxic mold is dangerous to everyone, it can have far worse consequences for babies because of an underdeveloped and comparatively weaker immune system. Most babies are naturally exposed to toxins at the time of birth and after – with the presence of mold in their surroundings they experience an additional risk of falling victim to health-related problems, such as, asthma, in the later stages of life. Let’s admit it: For most of us, investing in a property represents the most difficult decision of our lives. From ensuring that our life-savings are put towards something that can promise a reasonable return, to trying to avoid pouring in more money to address any hidden issues – investing in a house leaves plenty to consider. Having said that, mold infestations can damage to your home. Secretly growing behind walls, mold infestations spread very fast and can ultimately affect the overall integrity of your house. Mold feeds on materials, such as, wood and fabrics, and can easily affect your drywalls, wallpapers, and ceiling tiles, etc. Living inside your HVAC system, mold infestations can spread to other areas of your home, resulting in walls falling and ceilings collapsing. Mold has a very distinctive and highly unappealing smell. With mold growing inside a house, a moldy-smell can be your most important clue in determining the possibility of mold infestation. Being able to spot mold with a naked eye is the most apparent sign of mold infestation. However, most people are unable to distinguish it from dirt and soot, and find it difficult to confirm the presence of mold or the extent to which their house may be affected by it. Houses that have experienced pipe leakages, water seepage, structural damage, or flooding in the past are at the highest risk of facing mold infestation. 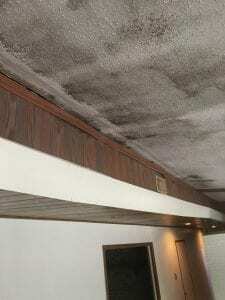 Mold thrives in a moist environment. Knowing that, it is critical for you to invest in a mold inspection if your house represents a perfect environment for mold to thrive. Hopefully, by now, you understand that the presence of mold means a serious threat to you, your family, and anyone else that occupies your home. Ready to get your house tested for mold infestations? As important as it is for you to get the inspection performed, it is essential that you only choose a licensed mold inspection company that offers unbiased mold inspection services. Avoid companies that provide both, mold inspection and mold remediation services to steer clear of a conflict of interest, and get in touch with a company that can offer you the most accurate and reliable results.